This summer, Arcadia Electrical Company kicked off its fifth New York City Housing Authority (NYCHA) job involving the installation of outdoor security lighting at the Pelham Parkway Houses in the Bronx. Senator Jeff Klein and Assemblyman Mark Gjonaj partnered together to fund the $2.1 million project and committed to staying involved throughout the duration of the project. Delivering this project to the residents of the Pelham Parkway Houses is their top priority in an effort to make the housing project cleaner, safer and more connected. As they have done at several other NYCHA housing projects, Arcadia is installing numerous lighting poles throughout the grounds in an effort to keep the Pelham Parkway Houses safer for residents. Ground broke on the project in June and the ribbon cutting ceremony was held in late July. Though the project was originally projected to be completed in April of 2018, Arcadia’s commitment to the community’s safety inspired an accelerated schedule. Residents can expect the area to be illuminated by the holidays, not based on any additional work. To view images of the ribbon cutting, click here. Electric TV highlighted the multi-million dollar lighting installation that Arcadia Electric did at the Polo Grounds Towers in Harlem for The New York City Housing Authority (NYCHA). Arcadia installed 341 new lighting fixtures at the Polo Grounds Towers as part of the Mayor’s Action Plan (MAP) for Neighborhood Safety, an initiative to reduce crime and increase neighborhood safety at 15 NYCHA development sites with some of the highest crime rates in the City. As a partnership between NYCHA, the Mayor’s Office of Criminal Justice, the NYPD and other city agencies, MAP was launched in July 2014 to bring together neighborhood residents and government agencies to implement a 21st century approach to crime reduction. Visit here to watch the full video. On Saturday, October 29, Assemblyman Nick Perry honored President Stephen Gianotti (Arcadia Electrical) and Local #3 IBEW Business Manager Christopher Erikson at his annual fundraiser for their efforts, as partners, for creating and promoting opportunity for an open and diverse workforce within the New York City Electrical Industry. Upon accepting the award, President Gianotti remarked, "Every day we strive to create an environment where both the ownership and the workforce of our companies represent the communities in which we work. I am proud to mention that New York Electric has the strongest contingency of MWBE contractors of any trade association in New York City. I promise you tonight that we will continue our long standing reputation of promoting diversity in our ownership and in our workforce." On this week’s show, we read a letter from the White House! The National President of the Communications Workers of America, Mr. Larry Cohen, attended the Local 13101 union meeting in Delaware to energize the members on stopping the Trans Pacific Partnership. LaGrange was there and he got the exclusive audio so we'll chat that up. 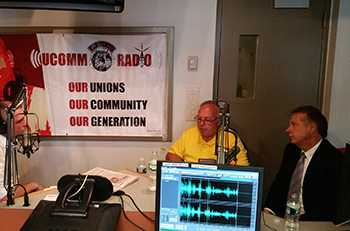 Stopping back into studio is Local 3's Chris Erickson and the leader of the National Association of Electrical Contractors Association NYC Chapter Stephen Gianotti. Plus we are getting heat on how we do our twitter reads so we'll dive into that as well and as always the UCOMM News Network, 3 minutes with Workers Independent News, this week in twitter and a few new alt rock tunes.